The War Memorial at Layer Cross, Layer de la Haye. 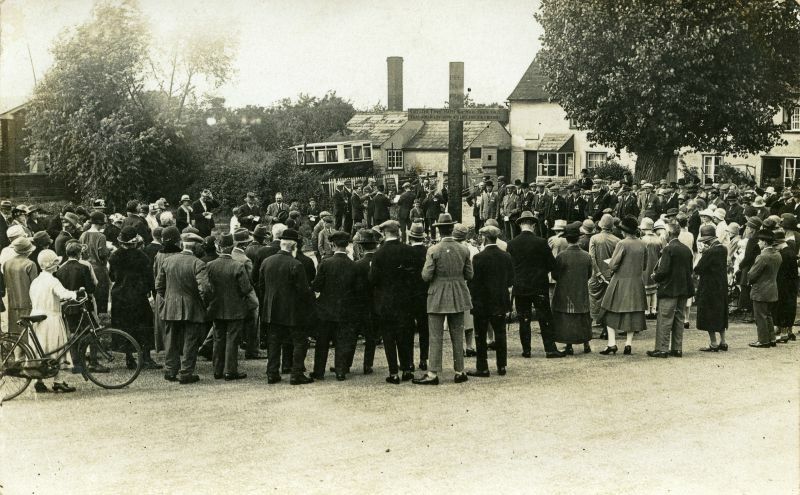 It is a large gathering with a band in the background, and is thought to be for the dedication of the War Memorial in the 1920s. The bus in the background belongs to Clarkes and the board in front of it advertises "Clarkes Bus Service". "The "Old" post office, run by a Mrs Watkins when I was kid [in the 1950s]. To the extreme right of that line of buildings (out of picture fronting the High road) was one the village shops owned and run by John Morses's (Forge Garage) mother. The other one was in the Malting Green road and was called Ridleys next to the butchers and slaughter house. Where the bus is parked was a small cobblers shop also when I was a kid where we were sent to get "Blakies" studs put in our shoes to make them last longer. That didn't work as we used to kick the road surface at night just to see who could make the biggest shower of sparks."